We’d love your help. Let us know what’s wrong with this preview of I Gave at the Office by Donald E. Westlake. Is it still possible in this age of generation gap, counterculture, revolution and militancy to write a funny novel about Caribbean dictatorships, the FBI, American business, Women’s Lib, gun-running, Erwin Rommel, divorce, pot, police brutality, the New Morality and selling rifles to the Indians? The answer is a resounding “Yes” if you happen to be one of America’s funnie Is it still possible in this age of generation gap, counterculture, revolution and militancy to write a funny novel about Caribbean dictatorships, the FBI, American business, Women’s Lib, gun-running, Erwin Rommel, divorce, pot, police brutality, the New Morality and selling rifles to the Indians? 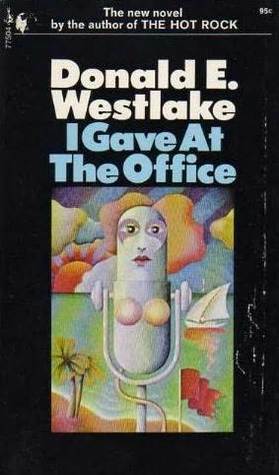 The answer is a resounding “Yes” if you happen to be one of America’s funniest writers named Donald E. Westlake, and your new novel happens to be called I Gave at the Office. • See Jay Fisher in troubled waters, having fallen off a boat in the middle of the night in the middle of the Caribbean in the middle of a thunderstorm. • See Jay Fisher spend an exciting Christmas in Wilton, Connecticut, with his ex-wife and his insurance man. • See Jay Fisher fall in love in a swimming pool with a beautiful blonde whose top is on the bottom. • See Jay Fisher, representing Good Americans everywhere, face-to-face with a Latin American dictator in the depths of his own palace, very nearly light his cigar. To ask other readers questions about I Gave at the Office, please sign up. This was a hard book to read, that is hard compared to other Westlake novels. Likely it was the story structure, set up as a series of cassette tapes explaining the protagonist's postion in a very touchy mess. Jay Lake is a news reporter for the Network(he never speaks of it in more than the capitalized word). He's mostly a stand-in interviewer for the Big Name. What he does is meet whatever celebrity scheduled for interview for lunch with a series of questions prepared in advance, records the an This was a hard book to read, that is hard compared to other Westlake novels. Likely it was the story structure, set up as a series of cassette tapes explaining the protagonist's postion in a very touchy mess. Jay Lake is a news reporter for the Network(he never speaks of it in more than the capitalized word). He's mostly a stand-in interviewer for the Big Name. What he does is meet whatever celebrity scheduled for interview for lunch with a series of questions prepared in advance, records the answers, and the Big Name is cut into the interview asking the questions. Lake sees his chance for the big time when a writer comes to him with the idea for a big TV special. Ilha Pombo is a small Caribbean island run by a dictator since the fifties. The plan is to follow a shipment of weapons being shipped to the island for an insurrection. In his true comic fashion, Westlake shaped the tale into a series of misadventures for Lake, meeting the girl in the swimming pool with the bikini top on the bottom, tripping and falling overboard a ship heading from the island and getting left behind, swimming ashore, arrested and set up for torture before it's figured out who he is,only to have no one know or believe what had happened. What happens is the network finds the whole thing a dud and decides to "help" out a bit. When it all falls apart, guess who gets left holding the blame? From the dust jacket: Is it still possible in this age of generation gap, counterculture, revolution and militancy to write a funny novel about Caribbean dictatorships, the FBI, American business, Women’s Lib, gun-running, Erwin Rommel, divorce, pot, police brutality, the new Morality and selling rifles to the Indians? Jay Fisher is a major network television announcer/interviewer. He is quick to point out that he is not a journalist; his normal job is interviewing celebrities during lunch at a New York restaurant called The Three Mafiosi. When a friend gives him a tip about a major news story, he arranges a meeting for his friend with the head of the network. The story is given a “go” and Jay is given the assignment to film the interviews that will make up the story on the alleged secret invasion of the island of Ilha Pombo. Of course everything that can go possibly go wrong does, and Jay finds himself the scapegoat of the subsequent investigation. I am a fan of Donald E Westlake, and his writing doesn’t disappoint in this book. He is a talented writer, with a particular gift for the comic crime caper. He has a way of describing implausible plots and colorful characters that just tickles my funny bone. But this book didn’t quite do it for me. I’m sure that is a function of the time span from when the book was written to when I am reading it. I kept thinking of Iran-Contra affair and Oliver North … but Westlake was writing a DECADE before all that hit the papers. It was entertaining and enjoyable … for about half the book. Then I got tired of the plot. For a great Westlake comic crime caper read The Hot Rock . For a more contemporary take on how extended unemployment can drive a man to murder read The Ax . I really like Westlake, but this one hasn't aged well. The portrayal of a network accidentally sponsoring a coup attempt is now farcical for being naive. The lazy misogyny of the crazed stalker ex doesn't help. Although I like reading Westlake as pure mind candy, this wasn't one of my favorites. The author hits upon the device of depicting a man recording his side of the story on cassette tapes, a device that could be interesting and novel for a chapter or two, but becomes somewhat tedious by the end. The story is mostly about a loyal employee who ends up in the wrong place at the wrong time over and over again. A few entertaining bits, but the plot wasn't compelling enough for this kind of reading. I get the point of it. It's very clever, for it's time. But kind of dated. Did anyone finish it and think it's worth the effort? Not a Dortmunder novel, but very much like one. Written a long time ago, and it shows. Donald E. Westlake (1933-2008) was one of the most prolific and talented authors of American crime fiction. He began his career in the late 1950's, churning out novels for pulp houses—often writing as many as four novels a year under various pseudonyms such as Richard Stark—but soon began publishing under his own name. His most well-known characters were John Dortmunder, an unlucky thief, and a ru Donald E. Westlake (1933-2008) was one of the most prolific and talented authors of American crime fiction. He began his career in the late 1950's, churning out novels for pulp houses—often writing as many as four novels a year under various pseudonyms such as Richard Stark—but soon began publishing under his own name. His most well-known characters were John Dortmunder, an unlucky thief, and a ruthless criminal named Parker. His writing earned him three Edgar Awards: the 1968 Best Novel award for God Save the Mark; the 1990 Best Short Story award for "Too Many Crooks"; and the 1991 Best Motion Picture Screenplay award for The Grifters. In addition, Westlake also earned a Grand Master Award from the Mystery Writers of America in 1993. Westlake's cinematic prose and brisk dialogue made his novels attractive to Hollywood, and several motion pictures were made from his books, with stars such as Lee Marvin and Mel Gibson. Westlake wrote several screenplays himself, receiving an Academy Award nomination for his adaptation of The Grifters, Jim Thompson's noir classic.